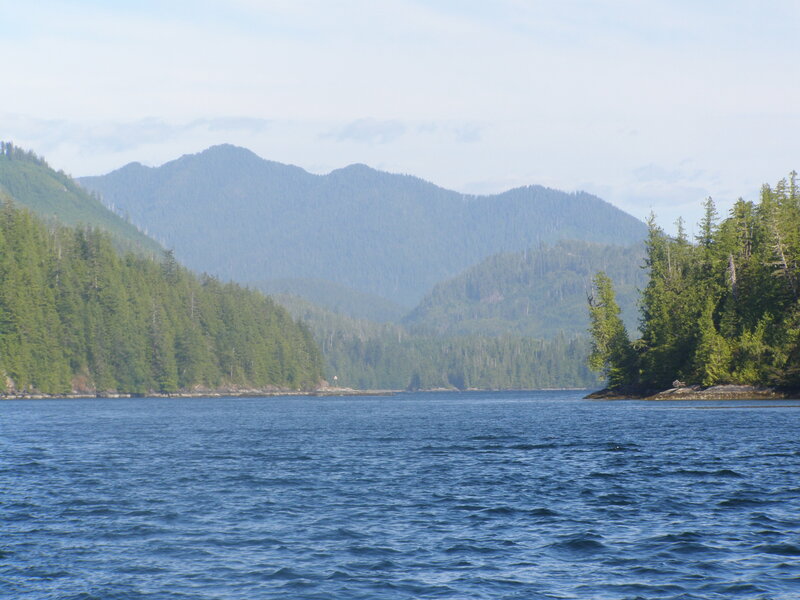 It had been a long day sailing from Ucluelet through Clayoquot Sound on the way to Hot Springs Cove. 48,7 nautical miles, most of those on the big Pacific open Ocean on the West Coast of Vancouver Island, in swells five to seven meters high and through fog so thick, you would have thought to be in the British Isles in November. Steamer Cove in Shelter Inlet, off Flores Island, was the furthest we could go that day. Located behind the Georges Islands, the inner cove was the choice of the old time steamers looking for true shelter from the frequent gales blowing through the West Coast. Our highest speed was 22.4 knots that day, no doubt coming down from the top of a giant wave, our all time speed record on the sailboat. After anchoring, we just had enough energy to lower the crab trap below the boat. 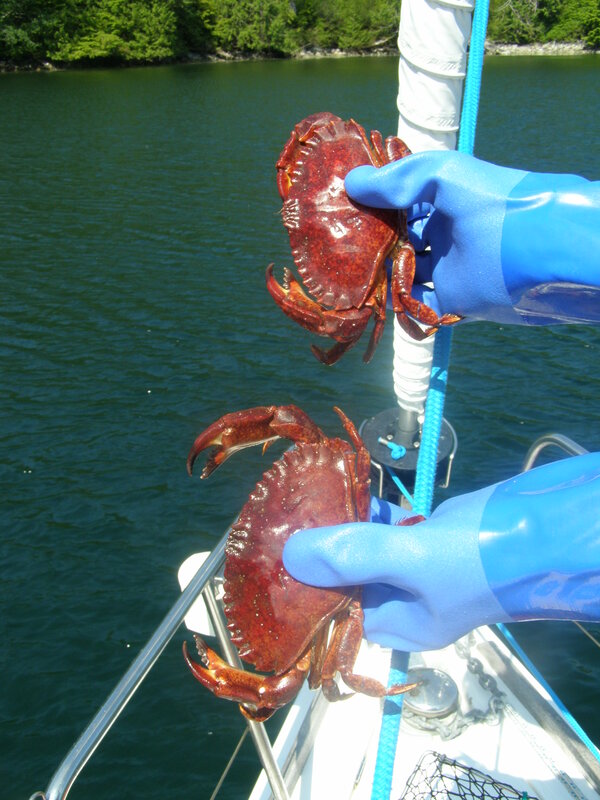 Next morning, we had the delight of finding two male Rock crabs well over 4,5 inches across, big enough to keep, and threw back the smaller guy overboard. Lunch that day would be much improved from the routine cheese and bread. The recipe for the Crab cakes had to be pretty simple. I started by dropping the crab claws and legs in a pot of boiling sea water, simmering for 5 minutes and draining. As soon as the crab was cool enough to handle, I removed the shells and gathered the meat in a bowl with one beaten egg, 2 tbsps mayo, ¾ cup Panko, the juice of ½ lemon, 1 tsp of red wine vinegar and 4 tbsps of a really tart salsa I had brought along for lunches on the go. I formed four cakes and fried them in a little bit of olive oil with a clove of garlic. The Rock Crabs are smaller and more work than Dungeness but the meat was very tender and tasty. As you see on the picture they are red even before they are boiled. I served the cakes with Frank’s hot sauce on the side and a salad of greens. 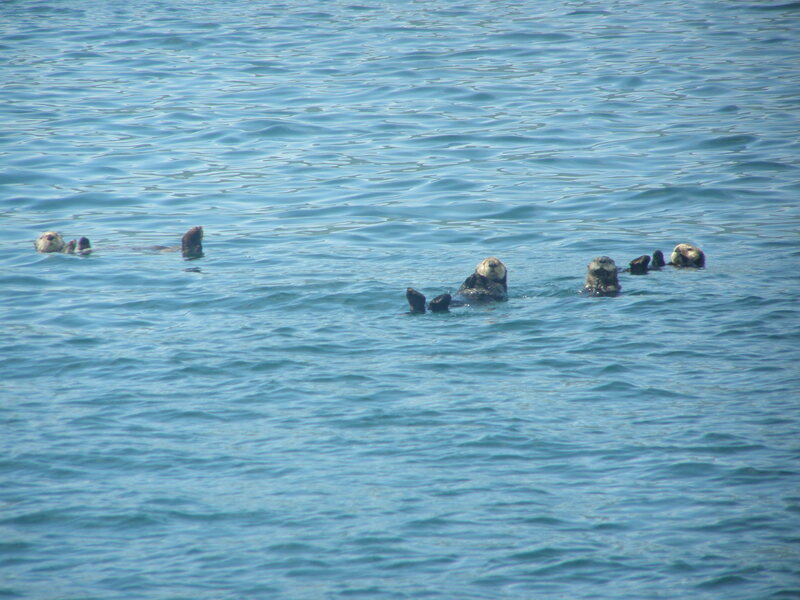 After lunch, as we were sailing towards Hot Springs Cove, we had a visit from a family of sea otters, enjoying the sun. And right by Sharp Point, a huge grey whale was feeding and showed her tail. Unfortunately, I was not quick enough to get a picture. 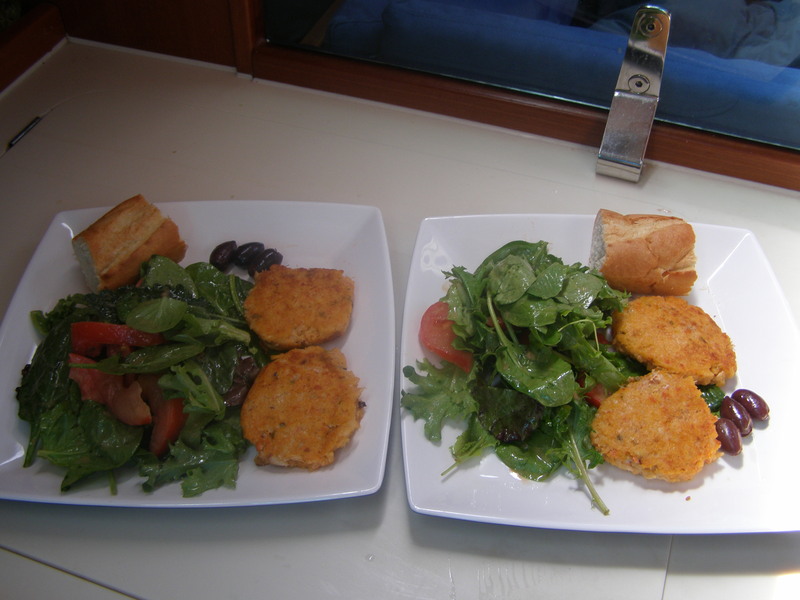 This entry was posted in Appetizer, Starter and tagged Clayoquot Sound, crab, crab cakes, food, recipe, recipes, Rock Crab, Sea otter, seafood, verygoodrecipe. Bookmark the permalink. You didn’t serve me crab cakes when I was sailing with you! I guess I’ll just have to come back. (You did give me nice spot prawns, though). Cheers! The marine division of the Cooking Frog! Ahoy matey, what a great story.